HFG Bangladesh and its partner Power and Participation Research Centre (PPRC) organized a discussion on pro-poor targeting titled as ‘Targeting the poor for universal health coverage (UHC) program inclusion: Exploring a more effective pro-poor targeting strategy” at the ATM Shamsul Haque Auditorium, CIRDAP, Dhaka on Sunday, June 10, 2018. Dr. Hossain Zillur Rahman, Executive Chairman, PPRC-led this review of targeting approaches in Bangladesh and said ‘Bangladesh needs a new generation of social protection programs, as we have a large population of the transient poor who face high health cost burden besides the chronic poor’ during the discussion. He also highlighted the new challenges in targeting the poor such as a three-dimensional application of poverty in urban, semi-urban and rural level which have been changing so frequently. 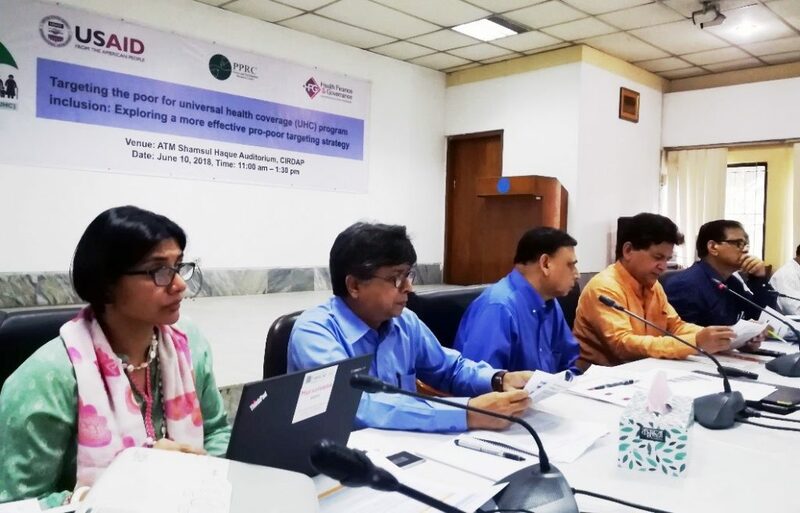 The study recommended a three-stage implementation cycle targeting approach with a good mix of geographic targeting, community and participatory approaches for the health program in Bangladesh. Professor Shamsul Alam, Senior Secretary, General Economic Division, Planning Commission took part as chief guest and mentioned that the study is very relevant in the context of the National Social Security Strategy (NSSS); which calls for streamlining more than 100 existing Social Safety Net Programs (SSNPs), and needs a more comprehensive targeting approach, he also empathized that this study should widely discuss with the ministries who are implementing the SSNPs. Dr. Mursaleena Islam, Country Manager, USAID’s HFG Project, Bangladesh shared the larger objective of the study was to draw appropriate lessons for designing a new generation of social protection programs, in the context of UHC. The study was based on a qualitative review of targeting strategies in operation in six selected social safety net programs in Bangladesh covering the areas of health, workfare, and food assistance. In his closing remarks, Dr. Sukumar Sarker, Senior Technical and Policy Advisor, Office of Population, Health, Nutrition & Education, USAID thanked all for participation and supports, he added that this study would be a benchmark for USAID and enable us all to understand how targeting approach should work. UHC is target 3.8 of Sustainable Development Goal (SDG) 3, to be achieved by 2030. UHC is to ensure that every person, everywhere has access to quality health care without suffering financing hardship. That is, UHC aims to reach every person of the country including the poor, marginalized, and disadvantaged. Thus, it is important to design and target social protection programs to specifically reach out these populations. Targeting refers to the social objective of concentrating resources of social protection programs on the target population, the poor and the vulnerable, so that they are the main beneficiaries of the programs. An important objective of targeting is to maximize the impact of the program with efficient delivery; this is to minimize inclusion of non-target population and to avoid unwarranted exclusion of target population. A cross-section of relevant stakeholders from academia, practitioners, policy-makers, health journalists and development partners took part in this dissemination and discussion.